Abbington of Arlington Assisted Living opened in July of 1998. This lovely, single-story community consists of 44 residential units. There’s plenty of common area, a beautiful interior courtyard, and walking paths. You will appreciate the comfortable, family atmosphere unlike any other assisted living community. We invite you to contact us or call Katie Bowie, Executive Director, at (614) 451-4575 ext. 201 (or option 3) for a personal tour at your convenience. 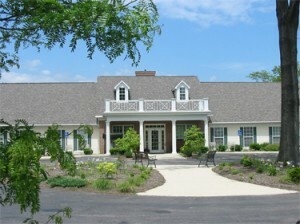 Abbington of Arlington Assisted Living is located in the Northwest Columbus/Upper Arlington area on Old Henderson Road, just west of Kenny Road. The neighborhood primarily consists of single family homes with dining, shopping and recreational establishments nearby. A great location! At Abbington of Arlington, we value the independence of our residents. No one wants to feel like a burden to their family. It adds stress for everyone. At our assisted living communities, the residents don’t depend on their children for everything. Instead of worrying about eating habits, medication, and housekeeping, visits can be relaxing, happy. When residents have their family visit we want everyone to be stress free. That’s what assisted living is all about. Now life can be enjoyed. Abbington really feels like home. Fellow residents become friendly neighbors. Cozy fireplaces and parlors give character to the surroundings. And the private rooms have enough space for personal touches. It’s not a hotel or a hospital. The room becomes your own. Residents can make it a reflection of their life. Pictures and decorations are encouraged. It’s not just a place to live, it’s home. Move in day was better than we could have ever dreamed and mom loves it. She had a rough first few weeks but everyone helped us get through it. I don’t see how the staff could have possibly done any better. Expectations were exceeded! The transition was very smooth. The facility went over and above expectations. My wife and I chose Abbington because of the willingness that the staff showed to go the extra mile to ensure that all of our basic necessities were covered. This enabled a smooth transition and has helped equip me in understanding the better care that Woody needed as he transitioned into assisted living. I truly appreciate the amount of professionalism that the staff shows and the genuine care they show for Woody. The staff provides a personal touch to an already difficult situation and it brings peace to both Woody and I.
Abbington has certainly been good for me. I can sure see and feel the improvement in my health! On July 10 2016 I will be starting my second year as a resident at Abbington. Having been an active person at church and in senior organizations, I had adjustments to make. The activity and therapy programs at Abbington were most helpful. Abbington is a nice place to live. Everything is just beautiful! It’s such a comfortable place to live; all of the staff is so kind and really takes care of my needs. I just love it!